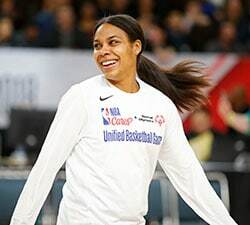 Note: WNBA.com’s Power Rankings, released every Tuesday during the season, are the opinion of this writer and do not reflect the views of the WNBA or its clubs. We are nearly a quarter of the way through the 2018 WNBA regular season with 49 of 204 games in the books. With every team having played between seven and 10 games, we have a decent amount of data to analyze at the quarter pole. This week, we’ll examine each team through the lens of the four factors – the four key traits that help define winning teams as developed by basketball analyst Dean Oliver. They are: accurate shooting (EFG%), limiting turnovers (TOV%), strong rebounding (OREB%) and getting to the free-throw line (FTA RATE) and can be applied to a team’s offense and defense. For each team below, we’ll give their four factors on both sides of the ball as well as their league ranking in each category to see how they stack up against the rest of their competition. The Sun are absolutely dominant in three of the four factors as they rank among the league’s best on both offense and defense in shooting, turnovers and rebounding. Not only do the Sun have the second-highest effective field goal percentage (52.1%) on offense, they hold their opponents to the third-lowest mark at 44.4 percent. Their biggest advantage comes on the glass as Connecticut grabs over 30 percent of offensive rebounds, while grabbing over 80 percent of defensive rebounds – posting the leading marks on both ends of the court. The Sun host the Mystics on Wednesday (7:00 ET, ESPN2) as they look for their eighth win of the season – something that didn’t come until their 15th game a year ago. The Sparks maximize their offensive opportunities by limiting their turnovers to the lowest percentage in the league. Conversely, they lead the league in forcing turnovers, which in turns leads to transition opportunities and easy baskets. L.A.’s rebounding is down slightly from a year ago, but keep in mind they opened the season very thin on the frontline without Candace Parker, Jantel Lavender and rookie Maria Vadeeva. Parker and Lavender are already back on the court and the 6-4 Vadeeva is in the U.S. and just about ready to join in. The Sparks open the week by hosting the Dream on Tuesday (10:30 ET, NBA TV) before hitting the road to face the Mystics and Sky to close the week. The Mercury are the top shooting team in the league in terms of effective field goal percentage and have been stout defensively, allowing the fourth-lowest shooting percentage in the league thus far. While they hold slight edges over their opponents in free-throw rate and turnover percentage, the Mercury currently rank last in both offensive and defensive rebound percentage. The Mercury have played more games than any team in the WNBA, hold a 7-3 record, and are riding a five-game win streak, so their lack of rebounding hasn’t hurt them yet, but getting those numbers up will be important for long-term success. On Tuesday, the Mercury’s league-leading shooting (52.4% EFG) will take on the league’s stingiest shooting defense (43.9 Opp EFG) when they visit the Wings (8:00 ET, Twitter). The Storm rank in the top half of the league in nearly every category on both sides of the ball, with the only exception being their turnover percentage. Seattle holds the third-highest effective field goal percentage, boosted by their league-best 8.3 3-pointers per game on 35.4% shooting. While they don’t miss often, when they do, the Storm rank second to the Sun in offensive rebound percentage to give them extra opportunities to score. Defensively, the Storm force the fourth-highest percentage of turnovers, secure the defensive boards, allow the fewest 3-pointers per game and do it all with limited fouls. The Storm fell to Atlanta on Sunday in the first game of a five-game homestead, which includes a marquee matchup with Connecticut on Friday (10:00 ET, NBA TV). The Wings have the WNBA’s fifth-ranked defense and much of that success is predicated on their outstanding defensive field goal percentage. Whichever way you measure it (39.5 FG%, 43.9 EFG or 49.6 TS%), no team posts lower opponent shooting marks than the Dallas Wings. On the other side of the ball, the Wings have fourth-highest rated offense despite ranking in the bottom half of the league in shooting efficiency. They do this by getting extra shots thanks to their offensive rebounding and by parading to the free-throw line more frequently than any other team in the league. The Wings have a pair of home games this week, beginning with the Mercury on Tuesday (8:00 ET, Twitter), followed by the Aces on Friday (8:00 ET, NBA TV). The Dream are 5-3 on the season and riding a three-game win streak despite having the lowest shooting percentage in the WNBA through their first eight games. Atlanta’s poor shooting from the field (39.2%, 12th) and from beyond the arc (29.8%, 10th) are key components to their league-low offensive rating (91.8). They have, however, balanced their poor shooting by shutting down their opponents and limiting them to 44.3 EFG%. The Dream have also excelled in the turnover game as they limit their own (tied for the second-lowest mark in the league), while forcing a high percentage from their opponents (2nd in league) with a league-high 8.6 steals per game. Atlanta’s three-game win streak will be put to the test Tuesday in L.A. against the Sparks (10:30 ET, NBA TV) before the Dream return home to face Indiana on Thursday (11:30 AM ET, NBA TV) in the first of two meetings to close the week. After opening the season 4-0, the Mystics have dropped four of their last five games. While part of that can be explained by Elena Delle Donne’s absence (she missed four of those games due to illness), the Mystics need to turn things around now that EDD is back and a date with the Sun looms on the horizon. Washington has been one of the best shooting teams in the league, but their strong shooting is nearly matched by what they allow to their opponents. In addition to making their shots from the field, the Mystics must find ways to get to the free-throw line. Washington had the third-highest free throw rate last season, but currently sit last in the league. As the Mystics look to get back on track this week, they will have to do so against two of the top teams in the league as the Mystics visit Connecticut on Wednesday (7:00 ET, ESPN2) before hosting the Sparks on Friday (7:00 ET, League Pass). Perhaps the most surprising storyline of the first quarter of the 2018 WNBA season has been the play of the Minnesota Lynx. 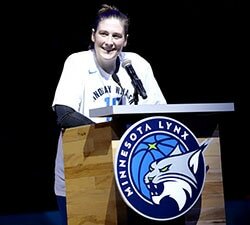 Consider this: the Lynx enter this week with a record of 3-6 through nine games; they finished all of last season with only seven losses in 34 games (or nine losses in 42 games if we include the playoffs). Minnesota had the second-high EFG% a season ago (52.3%), but through nine games that mark is down 4.4%, which drops the Lynx to the middle of the pack – a place they have rarely been this decade. Even more surprising are Minnesota’s turnover numbers, as they have the league’s high turnover rate (19.6%) while forcing the lowest percentage of turnovers from their opponents (13.5%). On a positive note, Sylvia Fowles is the league’s leading rebounder and helps the Lynx boast rebounding percentages in the top third on both sides of the ball. The Lynx are also getting to the free-throw line while limiting their opponents’ opportunities for free points. The Liberty are hovering right around .500 ball with all of their games being close. Through seven games, the Liberty have a point differential of minus-four (567-571) as none of their three wins or four losses have been decided by more than six points. A look at their four factors essentially shows us why as there is little to no separation between the Liberty and their opponents in any category – 0.2 difference in EFG%, 0.3 in TOV% and 0.1 in OREB%. The only category that stands out is free-throw rate, which is not in the Liberty’s favor. 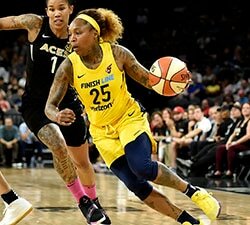 After dropping their first two games, New York has won three of its last five games; their last two victories came over the winless Indiana Fever and up next is a Wednesday matchup with the one-win Las Vegas Aces, followed by a Saturday matchup with the defending champs (8:00 ET, NBA TV). When prioritizing the four factors, Oliver ranked them as we show them above: shooting, turnovers, rebounds, free throws. Unfortunately for the Sky, they rank in the bottom half of the league in the top three factors on both offense and defense. The Sky get to the free throw line at a solid rate with 20.6 percent of their points coming from the stripe. Chicago got off to a promising start with wins over Indiana and New York to open the season. Since then, the Sky have lost five of their last six games, including an 18-point loss in their last outing that saw them score a season-low 59 points. They have a tough test ahead of them this week as they visit the Storm on Tuesday, before hosting the Sparks on Sunday (6:00 ET, NBA TV). The Aces have the league’s second-lowest rated offense (92.7 points per 100 possessions) and the four factors help explain why. Not only do the Aces have the second-lowest effective field goal percentage (43.1%), they have not been able to collect many of their own misses (22.7% OREB) in order to get second-chance points. And while they do get to the free throw line with outstanding frequency (0.385 FTA RATE), they have done a poor job of maximizing those opportunities. Las Vegas attempts 26.5 free throw per game (second only to Dallas’ 27.7) but are converting those attempts into just 19.6 points as their 74.1% free throw percentage ranks second to last in the league. The Aces will look for their second win of the season on Tuesday when they visit the 0-8 Fever in Indianapolis (7:00 ET, League Pass). The statistics don’t look good for the Fever on both sides of the ball when it comes to effective field goal percentage and free-throw rate. On offense, their own poor shooting (45.0%) is not being balanced by free-throw attempts (17.9 per game, 11th in league). And on defense, they are not only allowing the highest shooting percentage of any team in the league (51.6%), they are also allowing the highest rate of free-throw attempts, which only compounds their defensive struggles (106.4 Defensive Rating, 12th in league). 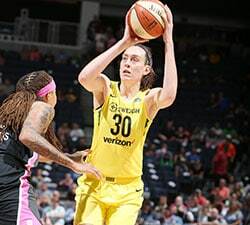 While the Fever have been unable to secure their first win of the season, six of their eight losses have come by single digits, including each of their last five and a season-low three-point margin in Sunday’s 78-75 loss to New York. The Fever get another shot at their first win on Tuesday when they host the 1-7 Aces before a home-and-home set with Atlanta later in the week.